After nearly a decade of watching and reporting on New England high school hoops at this website, and seeing countless games and prospects, there are only a few moments that truly stand out. Will Barton was spectacular in the 2010 NEPSAC Class A championship between Brewster and Winchendon. The final three minutes of that game were as exhilarating as I’ve seen at the prep level. There were Ricky Ledo’s battles with Wayne Selden, Nerlens Noel, Georges Niang and Tilton. When Ledo was at South Kent the game got so nasty that the officials called it with 20 seconds still remaining on the clock (Ledo scored 30+ in an upset victory). When Ledo was with Notre Dame Prep a year later, he scored 20 second-half points to bounce Tilton from the Prep National Championship, and a war of words broke out in the postgame handshake line. That Tilton group played wildly competitive games against a powerhouse Brewster bunch with a number of future NBA players (I believe the video below was from the first time the Noel/Selden version of Tilton went up against them). From a Providence perspective, Kris Dunn playing with his New London High School team at PC’s Alumni Hall was electric. That game symbolized the program turning the page to the Ed Cooley Era, where elite prospects like Dunn allowed Friar fans to dream of more. Gerard Coleman never developed into the top 60-75 talent he was projected to become, yet he turned in the best performance of any Friar recruit I’d seen when he scored 48 points against a Winchendon team that was as good as any in New England. Which takes us to this past Friday night. 2018 Friar commits David Duke and AJ Reeves were on the floor together one final time before teaming together at Providence next season. Duke is the leader of the defending NEPSAC Class AA champions, Cushing Academy. 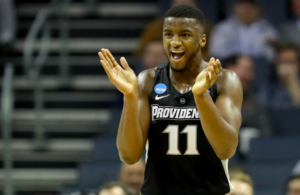 You’ve probably read comparisons to Dunn already, and those will most likely only ramp up when the Providence native steps foot on campus this summer. The comparisons are fair. Duke has Dunn’s size, the same massive defensive upside, and is simply an elite athlete. Friday night marked Reeves’ final home game at Brimmer and May, where he is the school’s all-time leading scorer. Those who want to draw the Dunn/Duke comparisons may take it a step further and claim that Duke and Reeves can be the duo that Dunn and Ledo were supposed to have been. 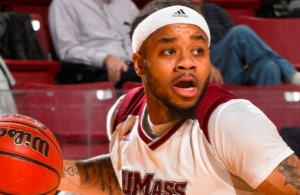 Like Ledo, Reeves is a big time scorer, but his career and personality are more similar to Dunn’s — with stability (Ledo played for four high schools) and the same maturity and ease with the media that Dunn brought to campus from day one. The game itself wasn’t overly memorable, with Cushing pulling away in the second half, but with the considerable upside of both players, it was hard not to be part of a full house in that small gym and feel as though we were watching not only a game, but a moment. Duke and Reeves went at each other hard. Reeves struggled with his outside shot in ways he hadn’t for most of the season, but found his way to 30 points through floaters, free throws, and step-back jumpers. Reeves’ offensive versatility makes him a great prospect. I’ve watched him a lot throughout this season and hadn’t seen the hanging floater he displayed in his final home game. His offensive inventory continues to grow, and I spent part of Friday night wondering if he’ll find scoring easier in some ways next season because he won’t have to do so much to free himself. Duke offered another reminder of makes him special. “Athletic” is often thrown around for players who are leapers, or fast end-to-end. Duke is certainly both of those (he even plays higher above the rim than Dunn), but beyond his vertical or 40 yard dash, it’s his body control and burst that make him outstanding. Two plays stood out on Friday night. Duke launched a 40-50 foot lead pass with his left hand on the money for an easy layup. I’d seen him toss nifty left-handed passes since last season, but nothing with that kind of distance. A few minutes later he drove and scored, and as Brimmer quickly advanced the ball to halfcourt Duke was back in the play defensively in an instant. I still don’t know how he got back so quickly, but the recovery and sheer will to get back into the play were eye-opening. 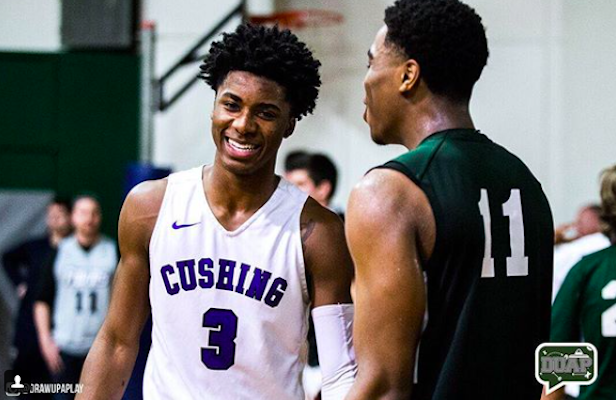 Reeves’ season ended the next day (with a 32-point effort in a win at Wilbraham and Monson) and we’ll have at least one more opportunity to see Duke at the high school level, as Cushing enters the playoffs as the three seed in an eight-team NEPSAC AA field. 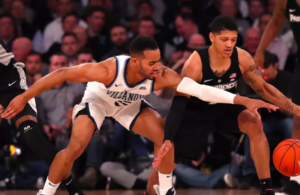 Watching the two future Friars, with equally high expectations and upside, could one day rank up there with any other memory over the past decade.